Carl Guthrie | 50 Westerns From The 50s. 50s Westerns Blu-ray News #184: Fort Massacre (1958). 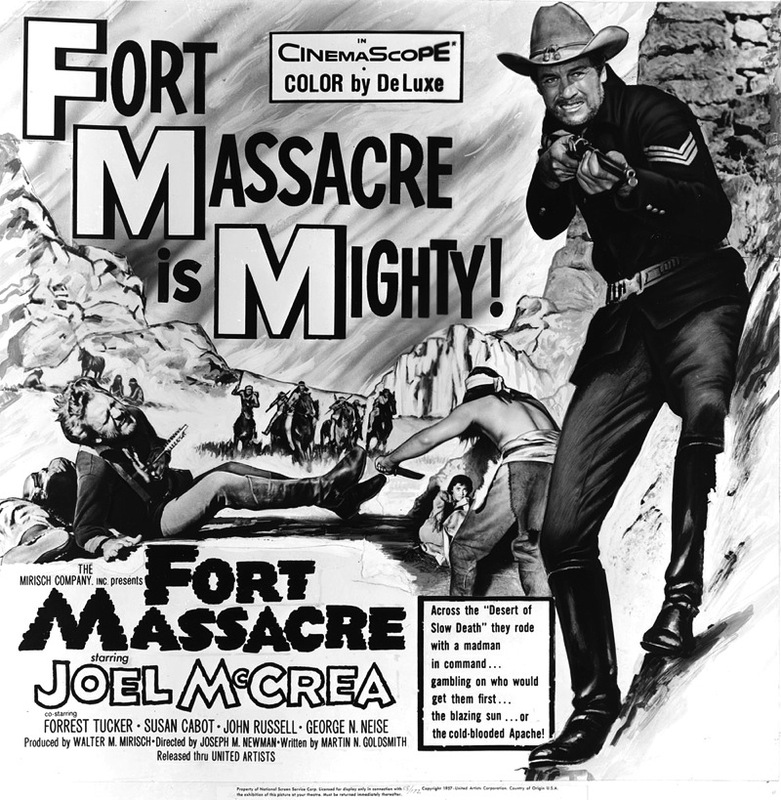 Every so often, someone will complain about how light Joel McCrea’s 50s Westerns were, but that’s something Fort Massacre (1958) will never be accused of being. It’s a really good picture with a tough, dark turn from McCrea — one of his best performances, I’d say. And Kino Lorber will bring it to Blu-ray before the year’s up. McCrea is Sgt. Vinson, a bitter cavalryman driven by a hatred of the Apaches, who massacred his family. When the commanding officer is killed in an ambush, McCrea takes the opportunity to lead the troops through Apache territory — for what the men begin to suspect are personal reasons. It was written by Martin M. Goldsmith, known for a couple of top-notch noirs — Detour (1945) and The Narrow Margin (1952). 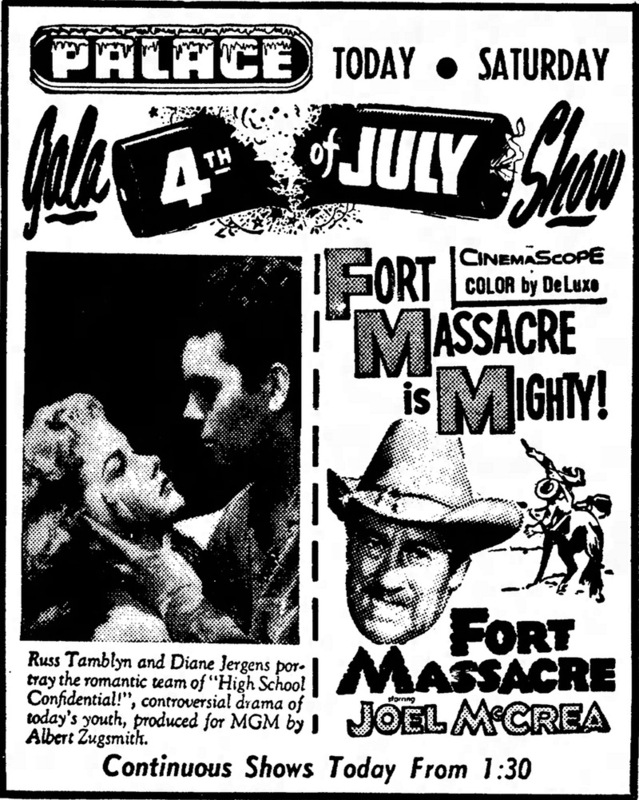 He brought a lot of Detour‘s fatalism to Fort Massacre (1958). Joseph. Newman’s direction is tight and assured, making the most of a small budget, and Carl Guthrie makes sure it all looks terrific. Highly, highly recommended. No, make that essential. 50s Westerns Blu-ray News #183: The Gunfight At Dodge City (1959). 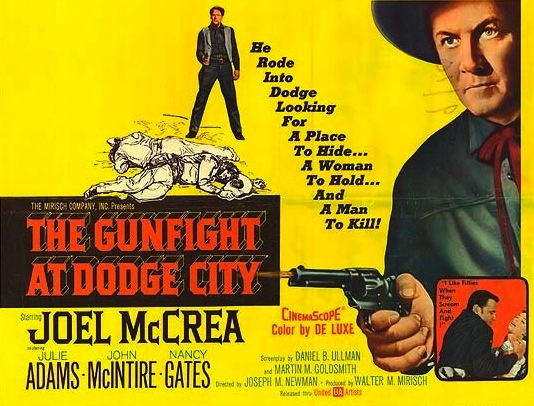 The Gunfight At Dodge City (1959) is a solid Joel McCrea picture, with a great cast and terrific CinemaScope photography from Carl Guthrie (whose late-50s Westerns are a thing of beauty). This is another fine example of what a middle-budget Western could be, and it’s coming to Blu-ray from Kino Lorber. Bat Masterson (McCrea) winds up in Dodge City, pinning on the sheriff’s badge to clean up the town and avenge the death of his brother. Along the way, he has to choose between Julie Adams and Nancy Gates — if only real life was like this! McCrea went into The Gunfight At Dodge City (1959) with retirement in mind — this was to be his last picture. But Sam Peckinpah (and Randolph Scott) lured him back in the saddle with Ride The High Country (1962). Whatever your misgivings (namely price) may be about the DVD-R programs in place at a number of studios, you have to admit they’ve put some pretty significant titles in the hands of the geeks who’ve been waiting for ’em. 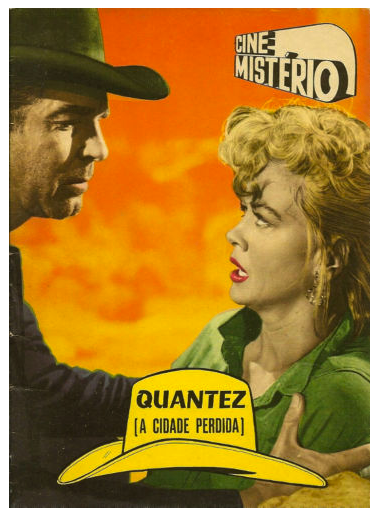 I’m a card-carrying member of that group of geeks, and I’m stoked to have Quantez (1957) in my hot little hands. Judging by comments I’ve received, I’m not alone. 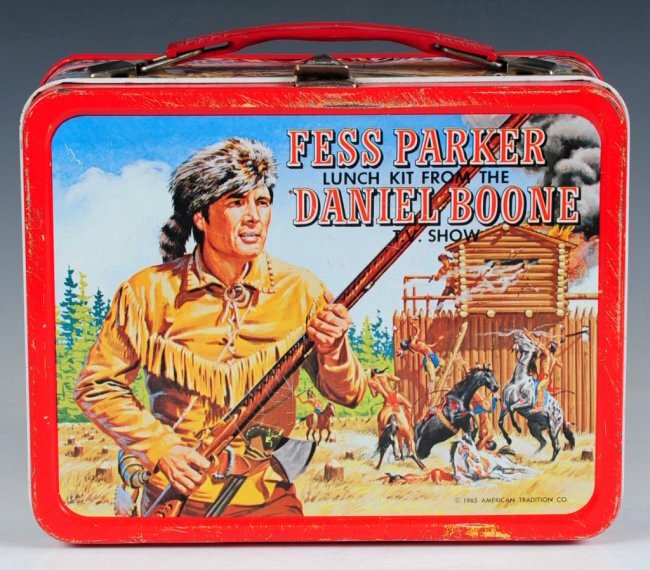 It’d been years since I’d seen it on TV, and I remembered it as a good Universal-International 50s Western, which is plenty good indeed. (That’s about like saying a “good Hammer horror film.”) Seeing it again, in a top-notch widescreen transfer, it’s a much better picture than I remember — and, to me, one of the better Universal Westerns of the 50s. 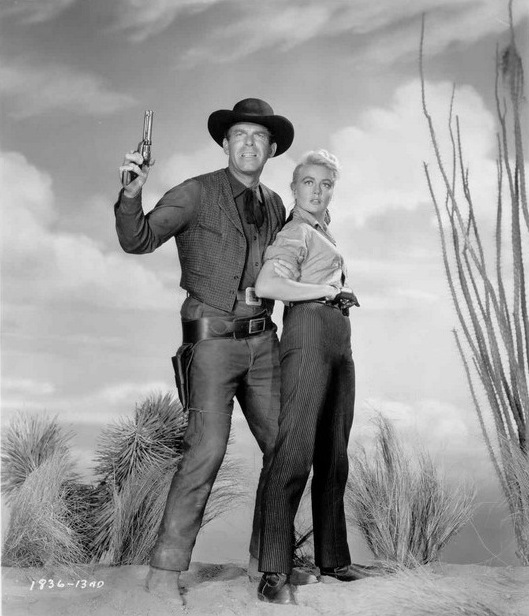 Fred MacMurray is Gentry, a tired gunman in a gang of bank robbers with a posse in hot pursuit. Riding into the desert, they take refuge in Quantez, a small town they find deserted. Their horses tired and near death, they’re forced to stay the night — with the plan to cross the border into Mexico the next day. The picture is the story of that night. I won’t spoil things by giving you much more than that. Just know there’s the usual tension and violence that erupt when you place a group of desperate men in such close quarters. And since there’s a bundle of money, a band of Indians and a woman with a past (Dorothy Malone) on hand, things don’t take long to heat up. MacMurray is excellent. John Larch comes close to being a bit over the top as Heller, the leader of the gang — but he always pulls back just in time. He’s a very bad man. Dorothy Malone is terrific as Chaney, a used-up saloon girl who feels she’s lost her chance to have a decent life. Westerns have never been known for their women’s roles, but this is a really good one, and she makes the most of it. 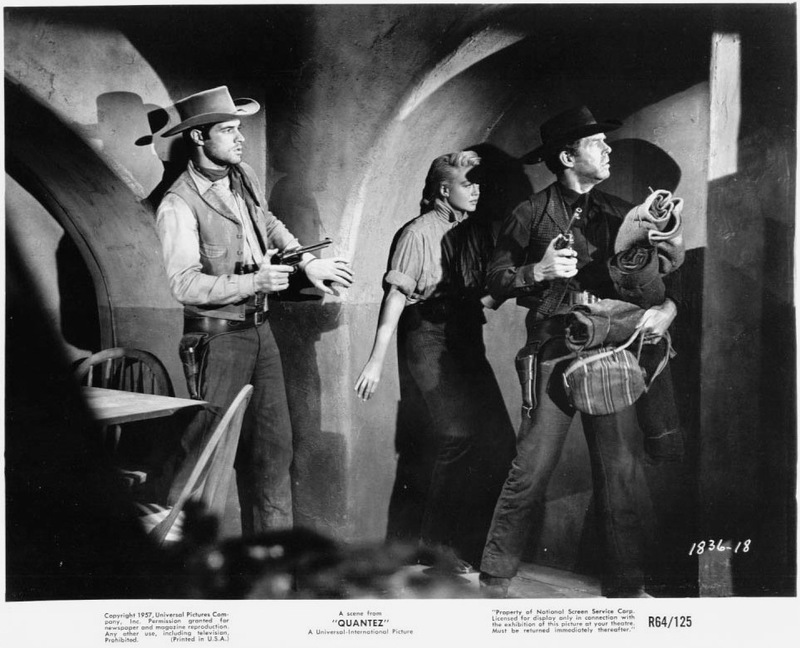 John Gavin, as the kid of the gang (every gang has one), and James Barton as a minstrel who passes through the ghost town in the middle of the night, provide strong support. This is a well-acted film. Well written, too. The plot isn’t much more than formula (not a criticism), but R. Wright Campbell’s dialogue is crisp and he avoids the expected often enough to keep things fresh. 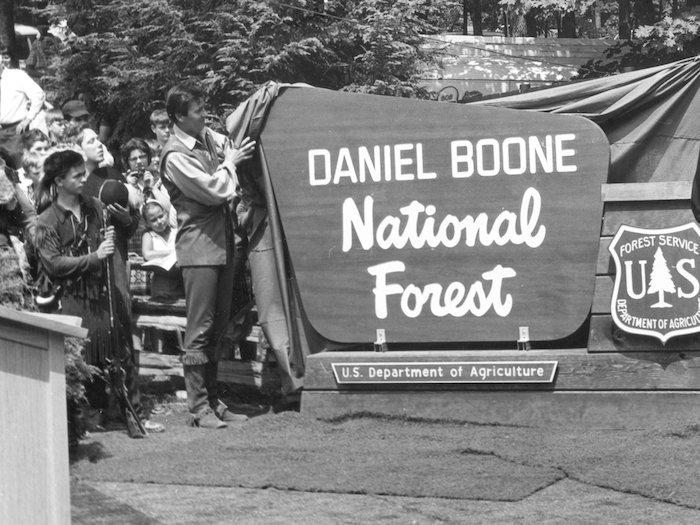 You never think of this as one of those pictures where the small cast is bottled in someplace more for reasons of budget than plot. The story just works. Campbell later wrote plenty of pictures for AIP, including the marvelous The Masque Of The Red Death (1964). He also did Gun For A Coward (1957), another good MacMurray Universal Western (available as part of the Vault Series). Thanks to Universal’s careful transfer, one of the real stars of the picture is Carl E. Guthrie, whose CinemaScope camerawork does the film a tremendous favor. (Go look at Guthrie’s list of credits sometime. Wow!) Given the mood and the many nights scenes, you might think this’d play better in black and white. But some ingenious lighting — rich blues at night and reds as the sun comes up — gives the picture a very effective look. This is one of the richest-looking Eastman Color films I can remember. Of course, we have to give director Harry Keller plenty of credit. Starting out as an editor at Republic, by the time he reached Quantez, he certainly knew his way around a cowboy picture. There’s lots of dialogue here, but Keller keeps things moving at a brisk pace. A year later, he’d be one of the contract directors U-I would draft to “fix” Orson Welles’ Touch Of Evil (1958). Universal should be commended for giving Quantez such a beautiful transfer. And while in a perfect world, this would’ve hit video on Blu-ray, the DVD-R (the Universal Vault Series is an Amazon exclusive) looked terrific and played fine. There are no extras, not even a trailer. But who’s to complain when it looks like this?